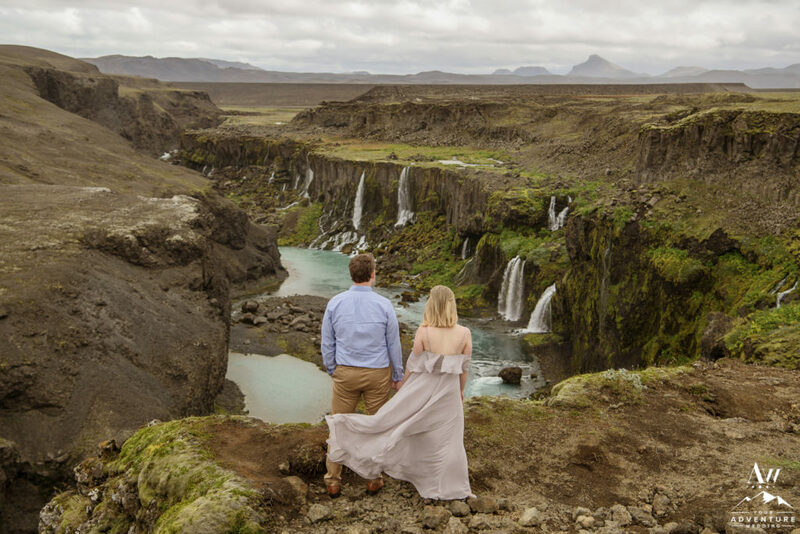 Celebrating your wedding anniversary each year, is an important aspect to keeping your forever newlywed game strong! 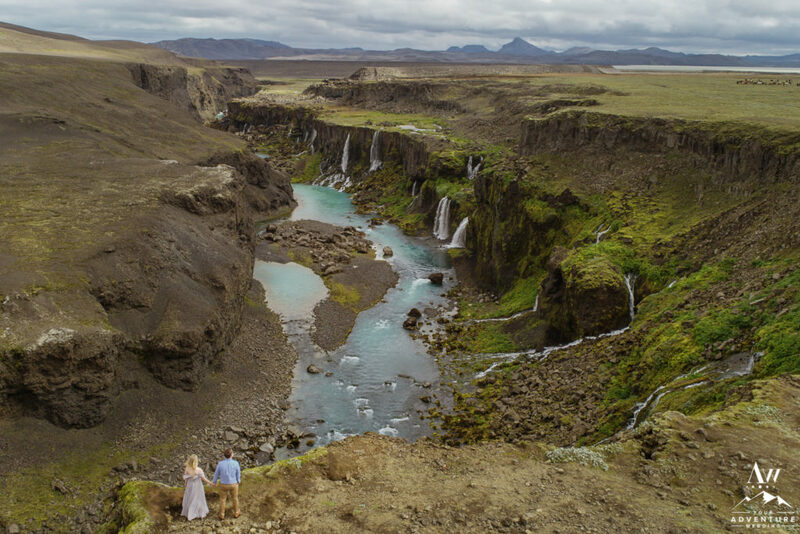 There is something really powerful about taking a few minutes to reminisce over your adventure wedding, saying your wedding vows again to each other, or crafting new ones as your love and family grows. 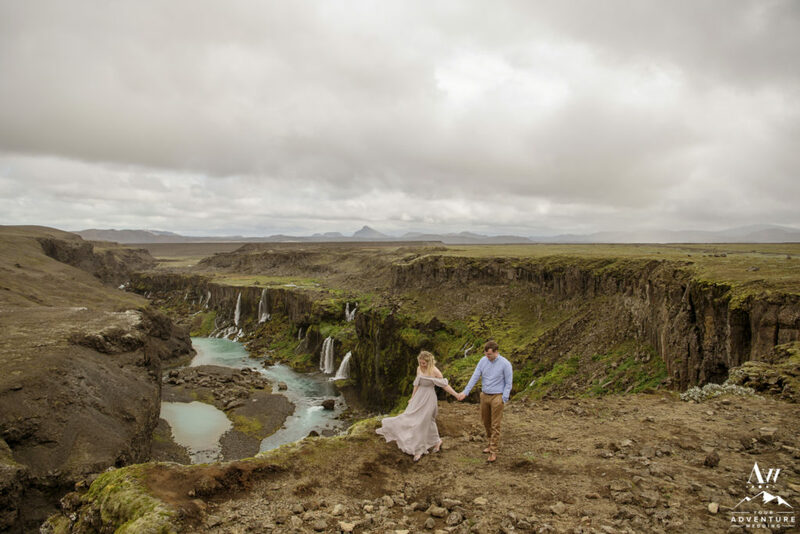 Yet another grand way to document your marriage each year is to hire a photographer and embark on another wedding adventure. 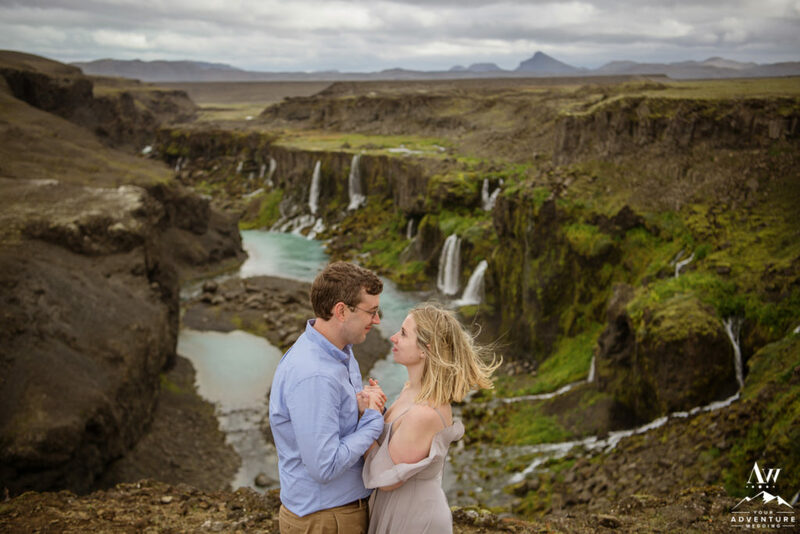 One of our favorite repeat clients came back this past August for their waterfall wedding anniversary portrait session with our team. 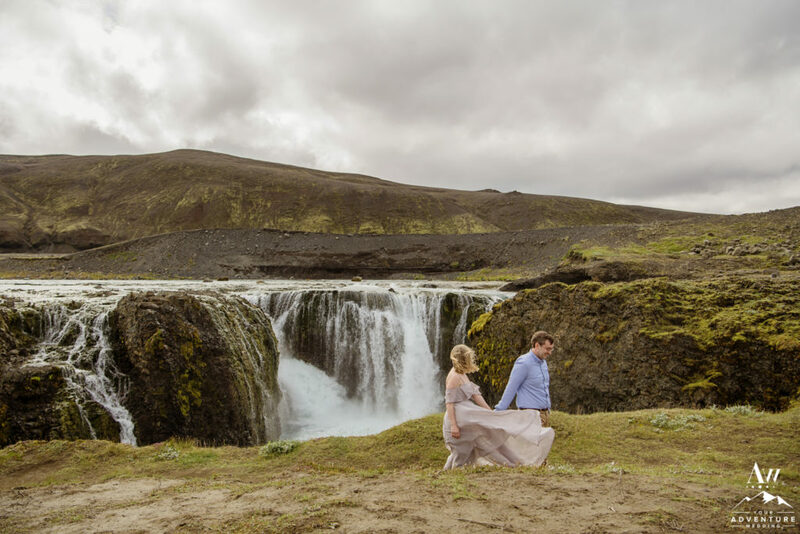 You might remember Rachel and John from last years, Perfect Luxury Elopement in Iceland. 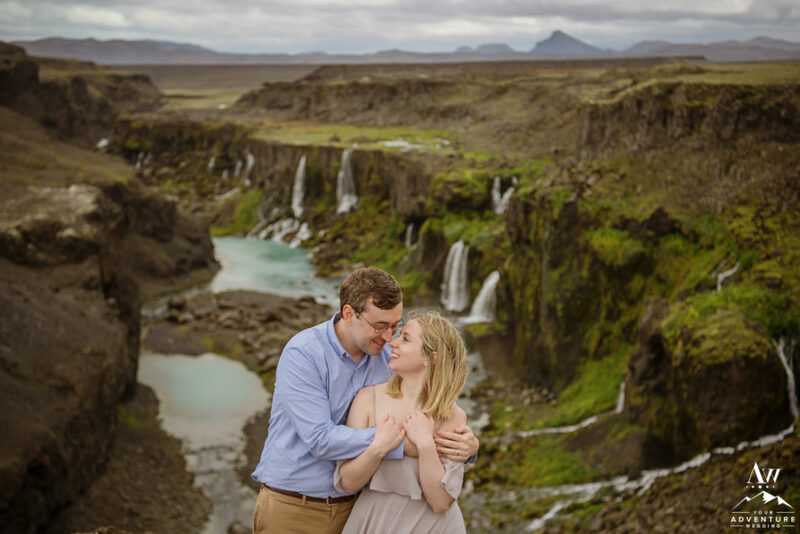 Or maybe from their previous Iceland engagement session? Either way, they are REALLY freaking ADORABLE together and our team loves spending time with them. 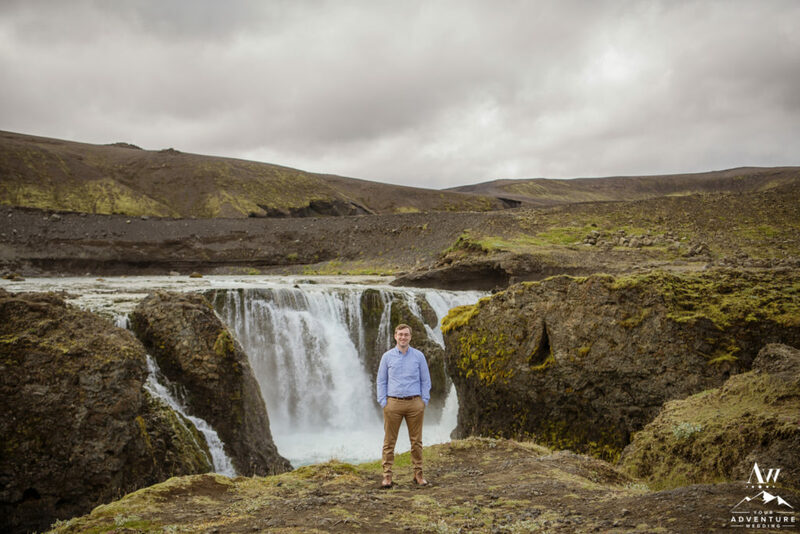 From the moment they first contacted us we new they would find themselves totally obsessed with Iceland and all of her wonder. 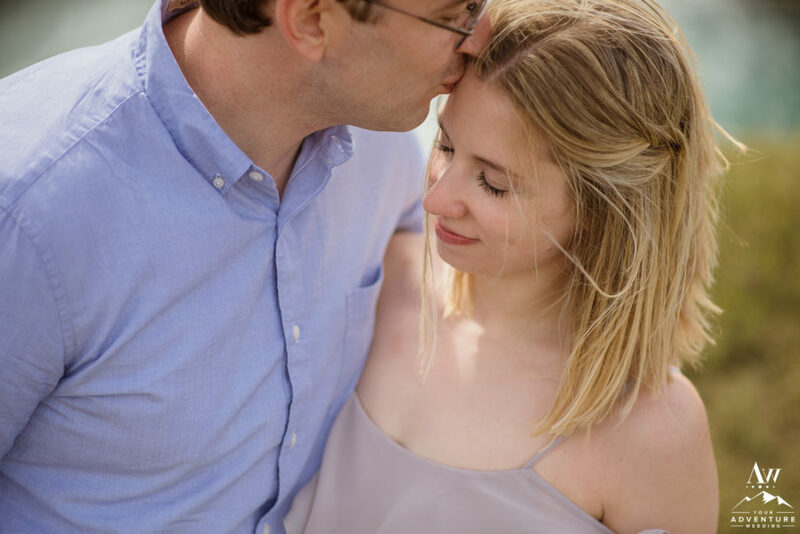 Why Plan an Anniversary Photo Session? 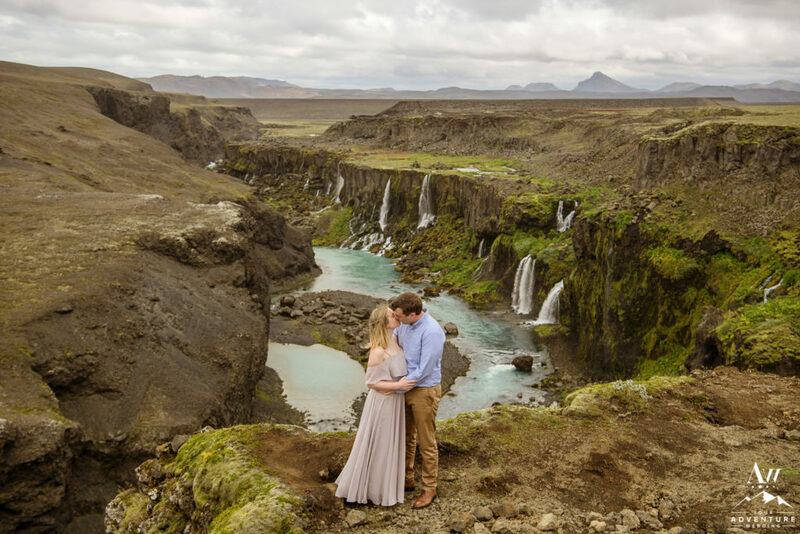 As you near your first wedding anniversary date, you might feel a little shy to get in front of the camera after your wedding day just a short year ago. 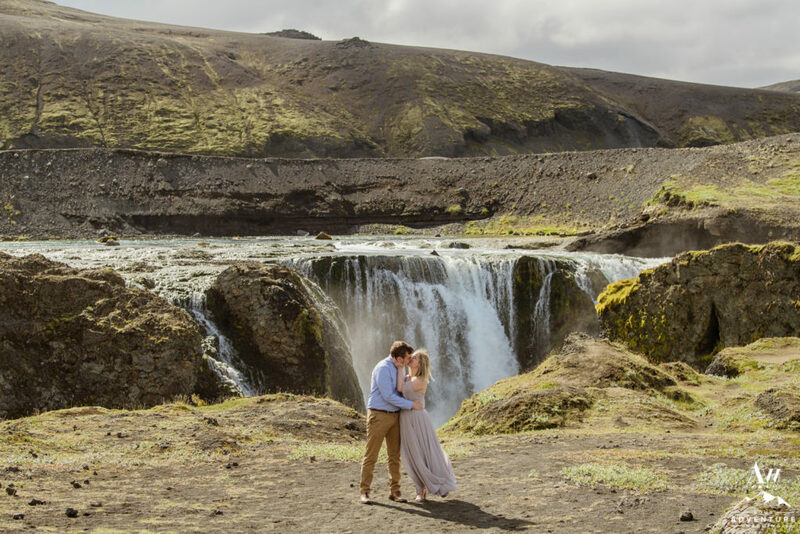 But our Iceland Wedding Planner team would like to bring to light to several reasons why you should consider planning an anniversary photo session, now and every year together! 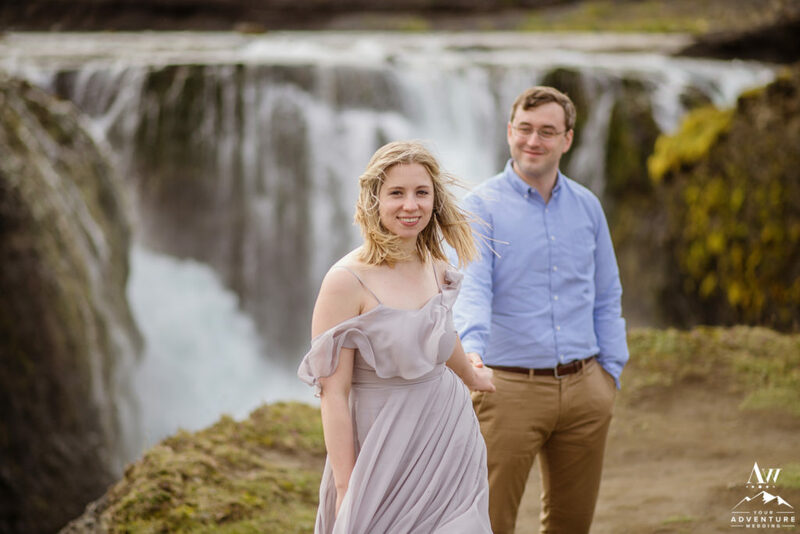 You might have held a traditional wedding in your home country the first time around, so having a waterfall wedding anniversary session in Iceland can be an incredible way to express that through photos! 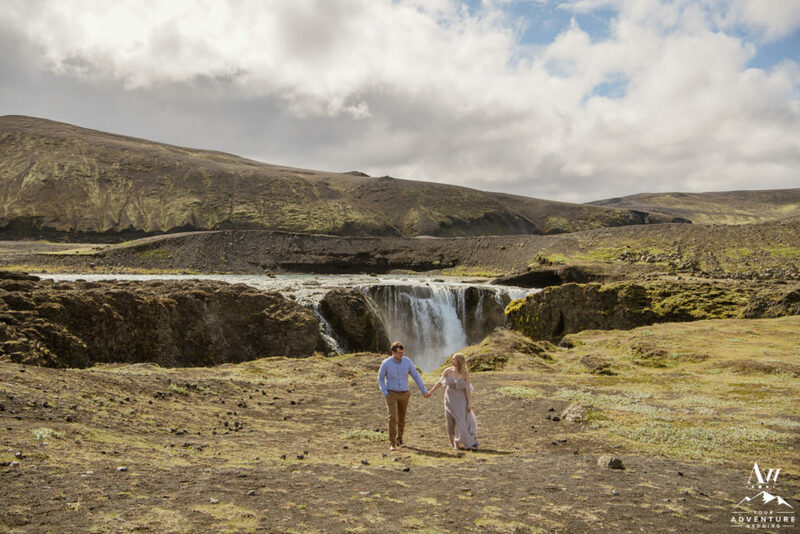 Adventuring together is extremely important because embarking on experiences together and sharing in new things together grows your lifetime bond. 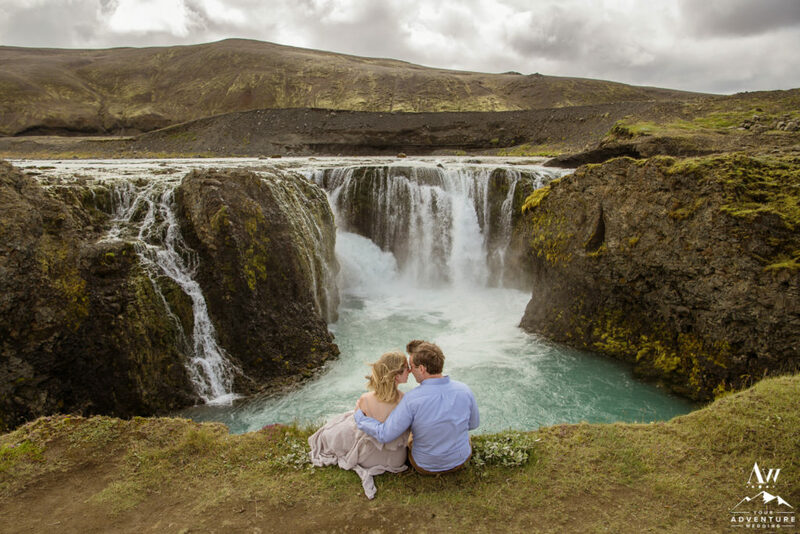 At some point in time when your marriage life gets tough, doubts may flood in. 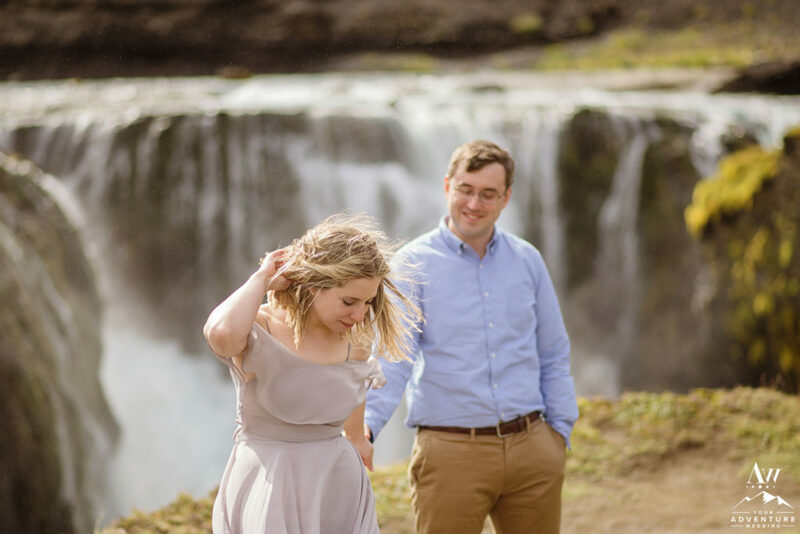 Having Iceland wedding anniversary photos to look back on to see how you looked at each other, how you enjoyed exploring together, and what that year was like for you both. 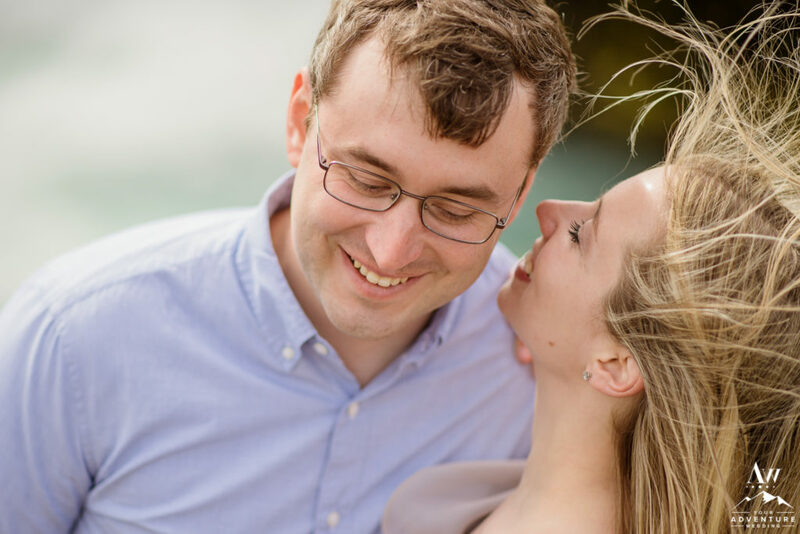 ::Knock on Wood:: Having these moments of happiness could very well be a marriage saving grace for you then or down the road. 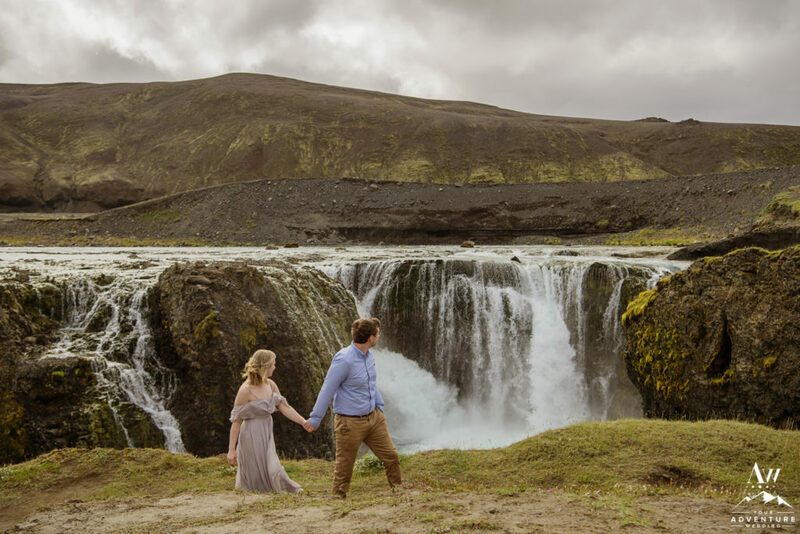 By planning a waterfall wedding anniversary session in Iceland, you will also find yourself exploring more of Iceland! 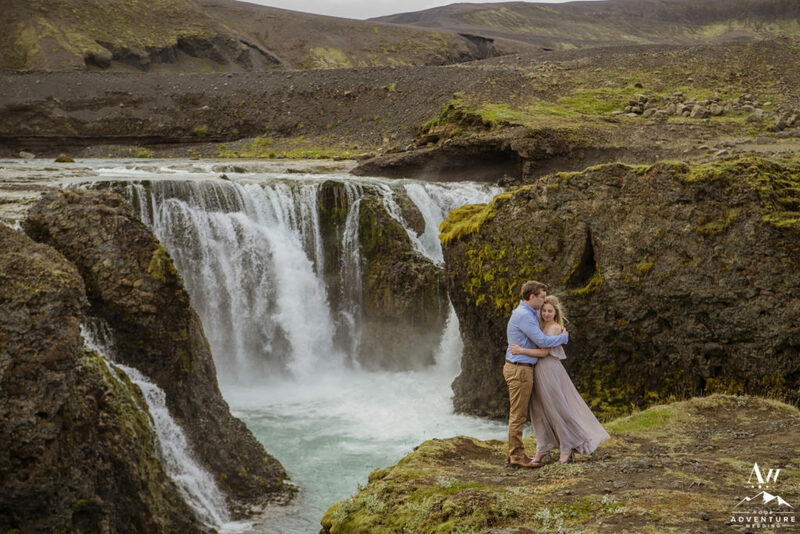 Maybe the first time you came it was winter, then you married in summer or held your Iceland anniversary session. Gives you something to look forward to. More often than not, we get caught up in life. Sometimes it chews us up and spits us back out. Little things to look forward to in your relationship together gives you a ray of sun despite the storms you may encounter. It also gives you that “we can do anything together” kind of attitude. Thinking positively about your relationship and spouse can be half the battle sometimes. One of the coolest things about Rachel and John, is that they always role with the punches. 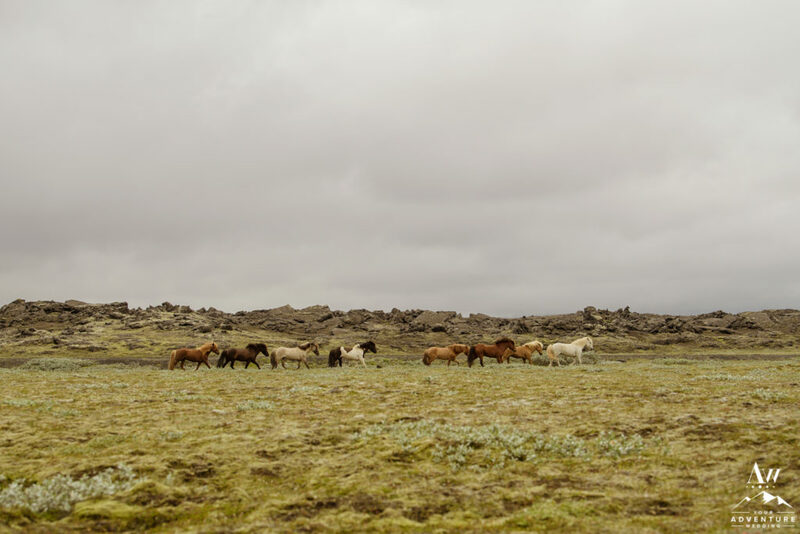 They know life happens and you often cannot control some things. But what you can do is choose JOY and find the best within every single situation. And when you do that you are an unstoppable force. 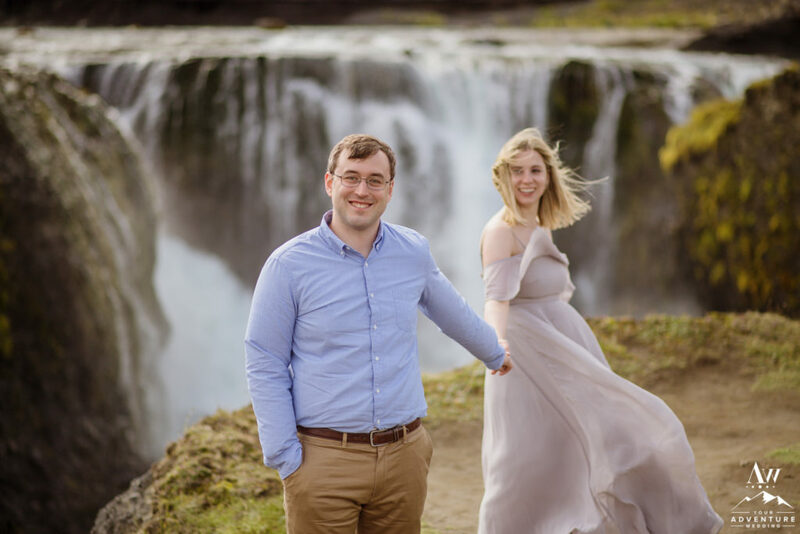 As you’ll read in our previous post about Rachel and John’s Iceland elopement, they were planning a big wedding back home on the East Coast, but decided to elope first for THEM. 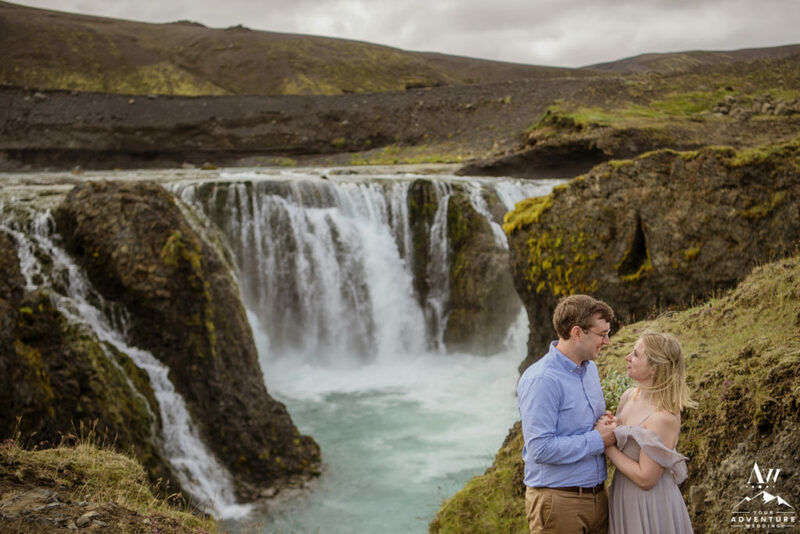 As soon as Rachel and John left last year after their August cave elopement in Iceland, they wanted to come back. 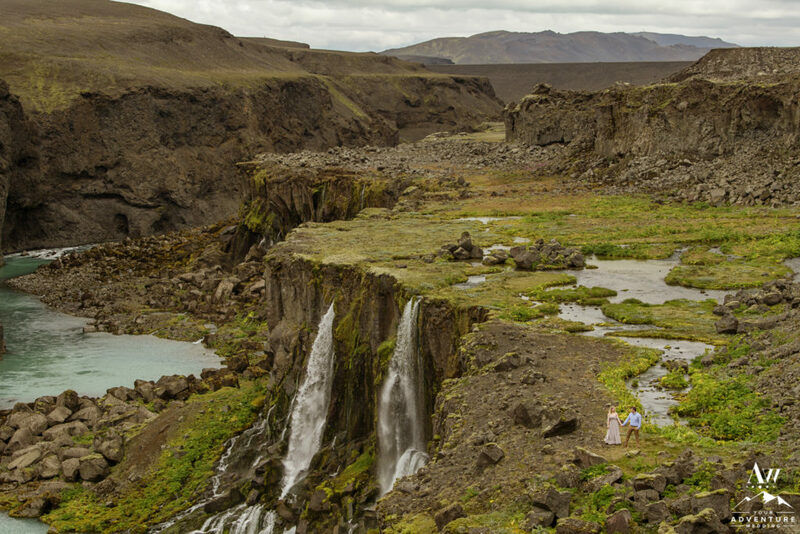 Iceland is forever in their hearts. 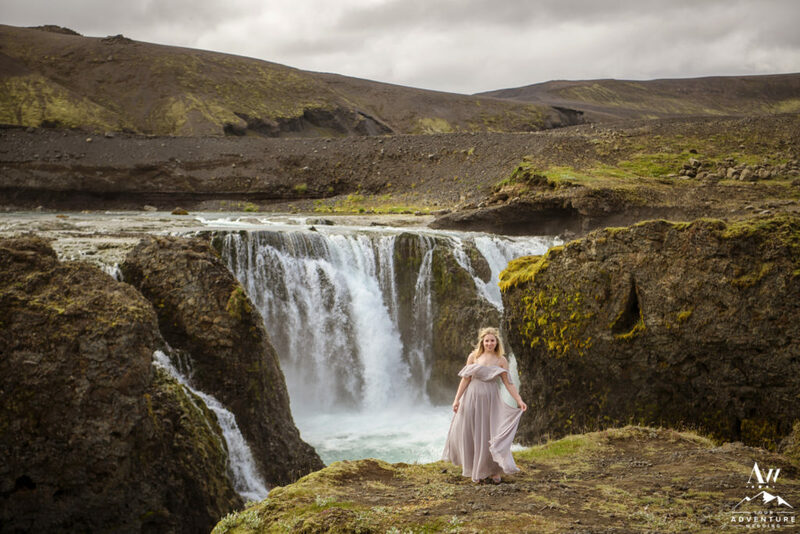 To continue their obsession for the landscape, they are both followers of our Iceland Wedding Planner Instagram account. 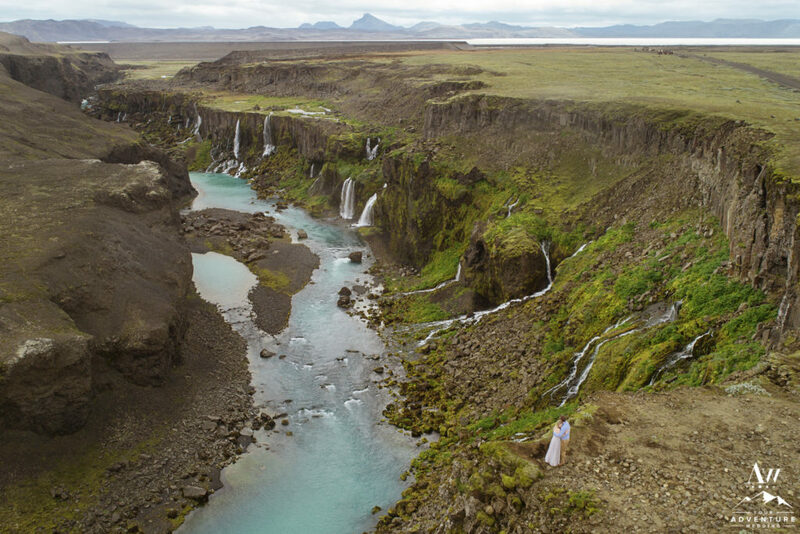 Our team weekly goes out to scout new Iceland wedding locations (follow our Insta-Stories if you find yourself curious). 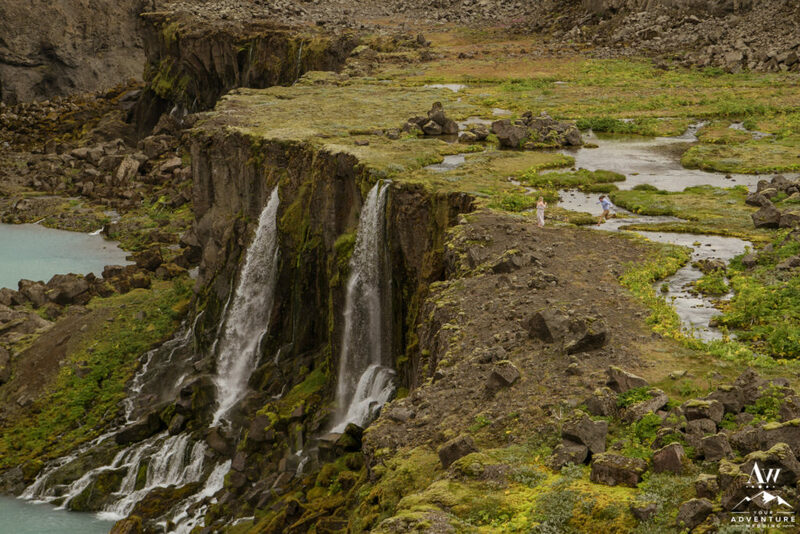 One week Rachel was blown away by an area we fondly refer to as our Jurassic Park Waterfall. 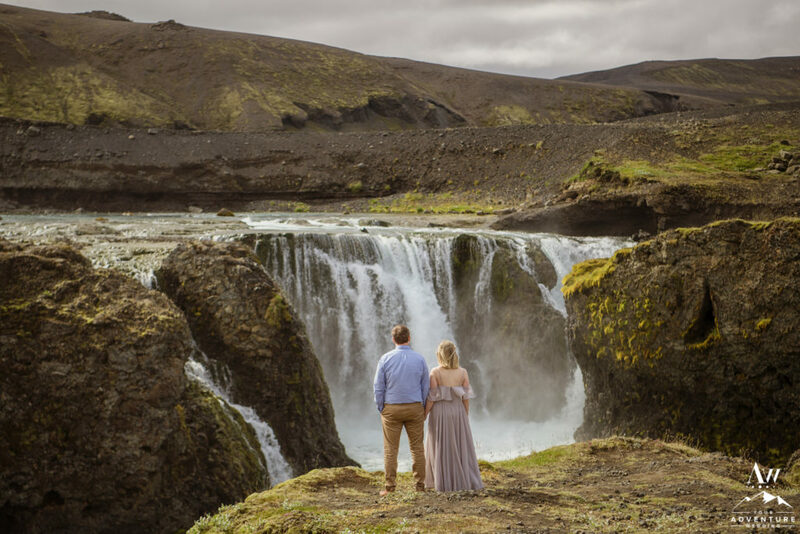 From that moment, they found a way and planned to come back to celebrate their first year by having a waterfall wedding anniversary session! Their newlywed game is strong!! 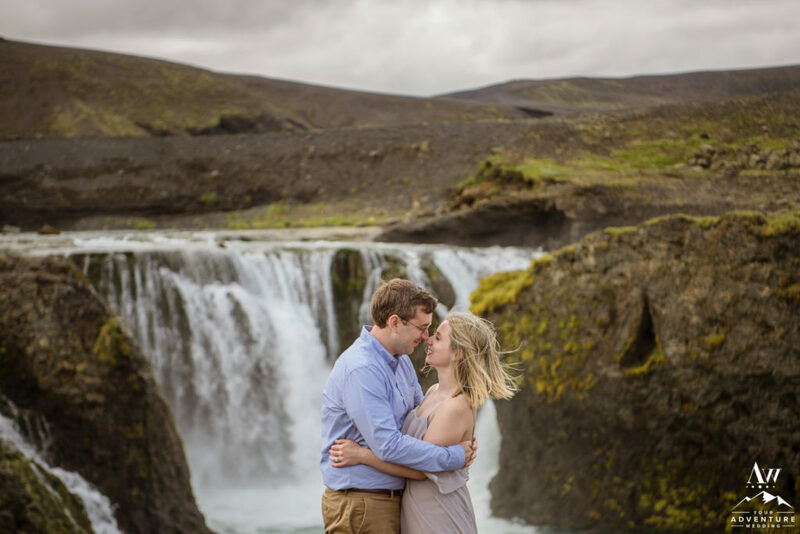 So come along with us today as revel in their gorgeous and adventurous couple’s session in Iceland! 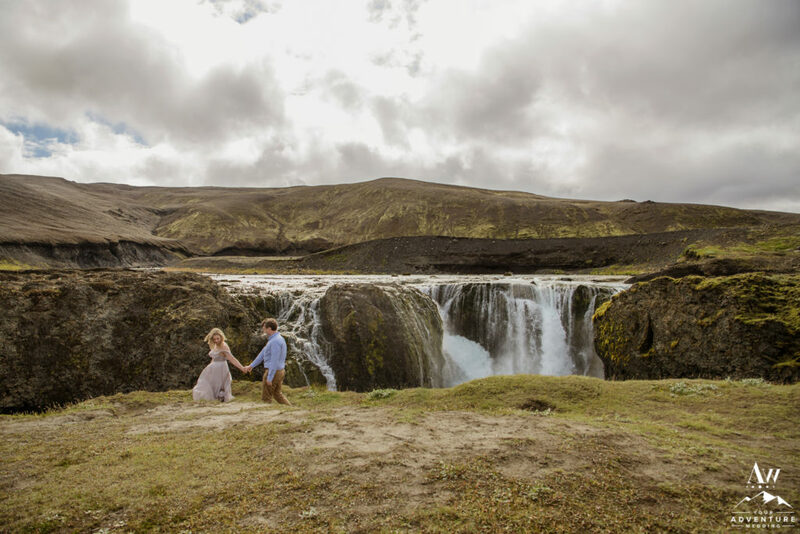 The first waterfall Rachel and John visited with our Iceland wedding photographer via red super jeep, was one that is in the highlands and hidden. Walking up to the falls they were blown away by the sounds and views. 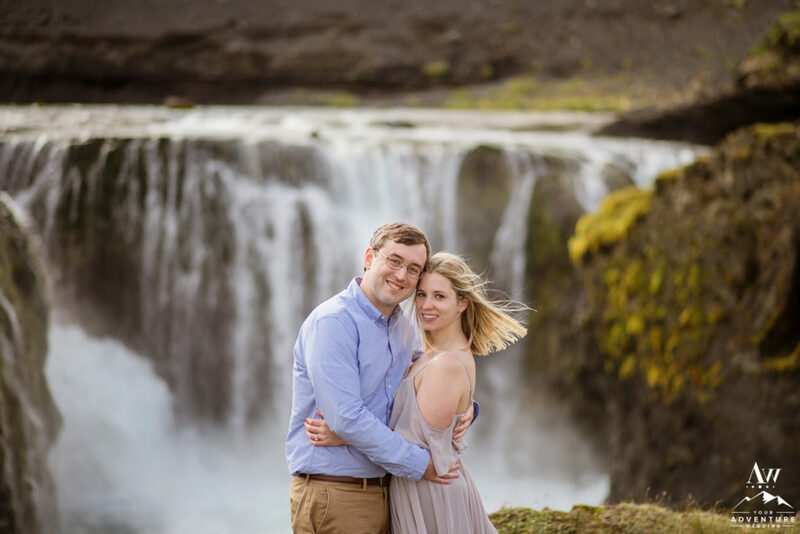 The smiles, the looks, the adoration… These two were seriously GUSHING of love!! 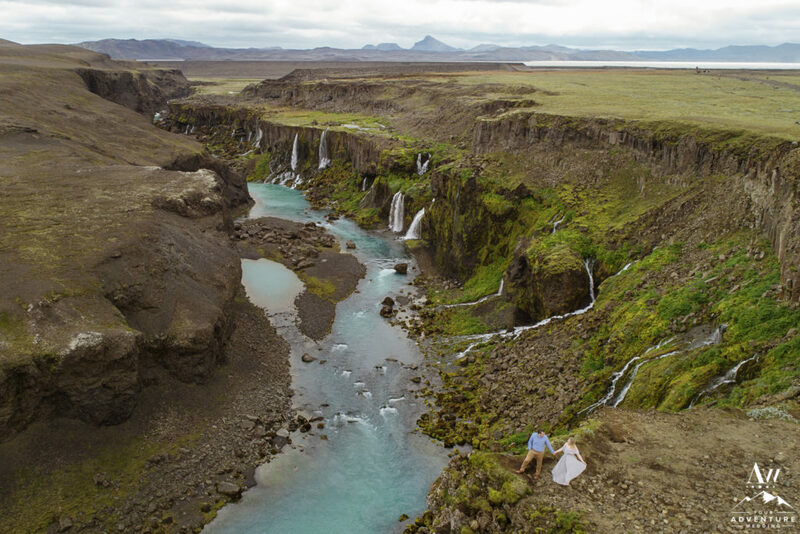 They really get what it’s like to be a forever newlywed! 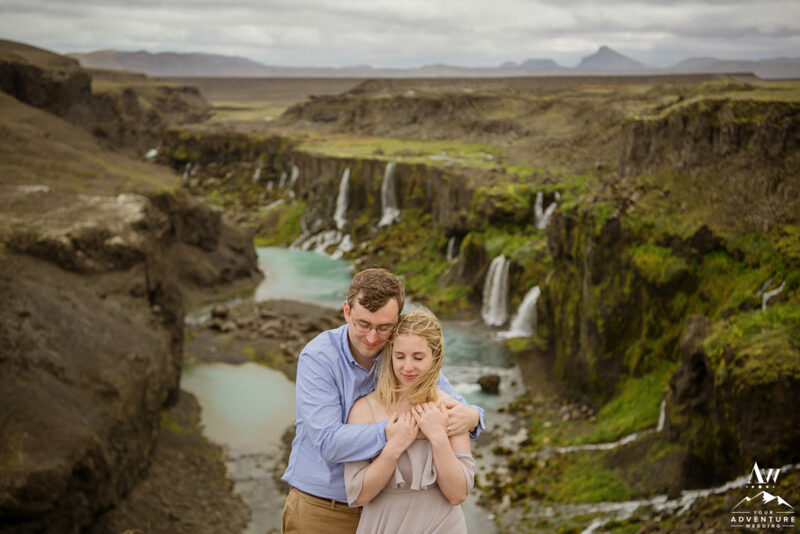 Rachel and John’s waterfall wedding anniversary session in Iceland, was one of our most adventurous to date! There is a magical feeling about this place. 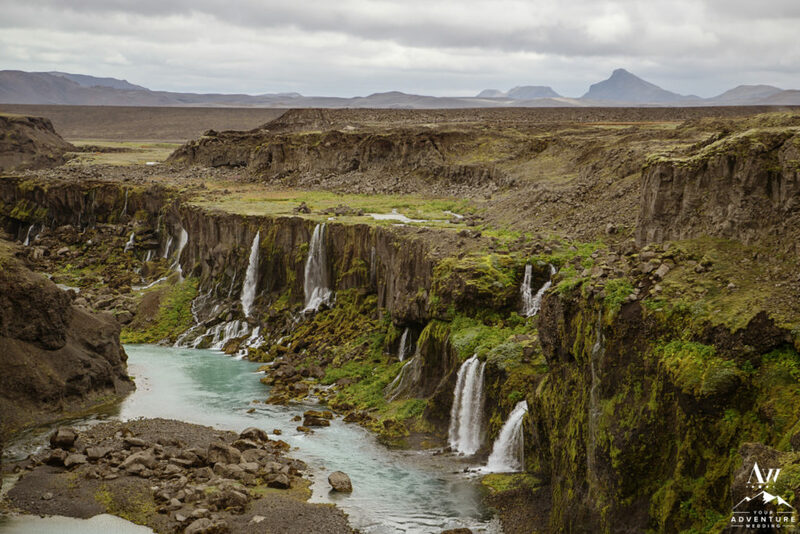 It feels alive, vibrant, and like you found your very own slice of heaven on earth. 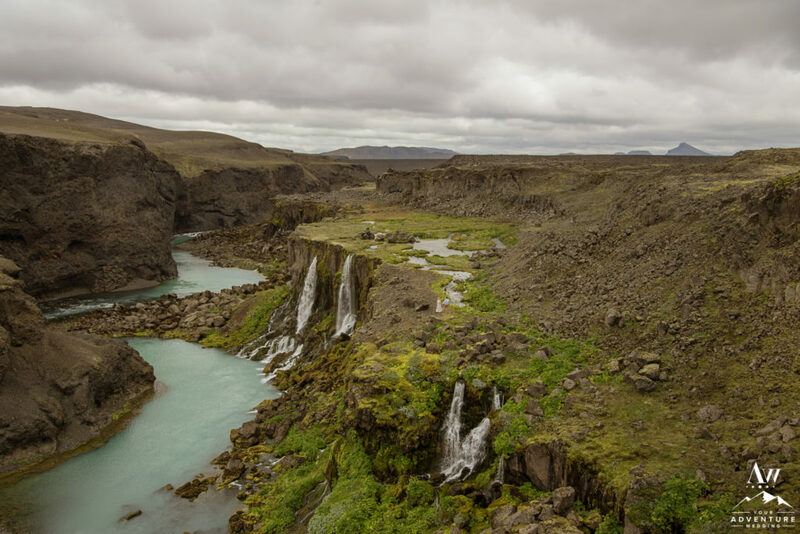 When you arrive, you are overwhelmed by the fact that something so special like this exists! 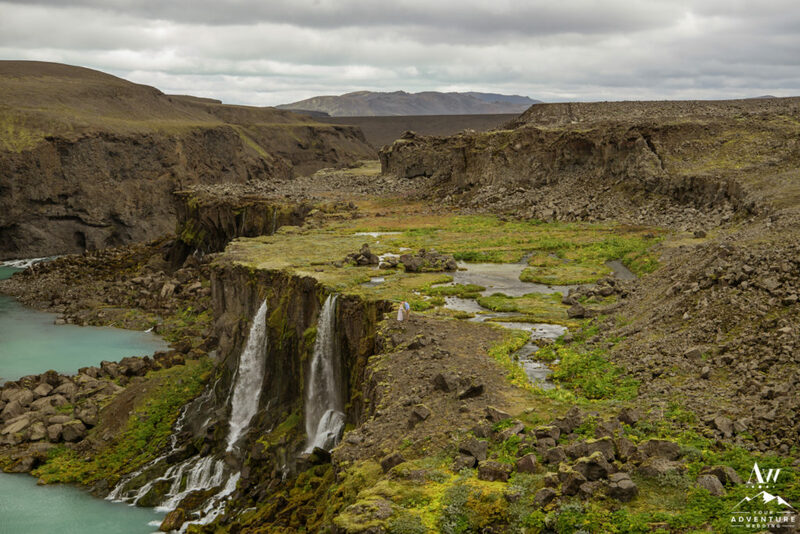 It’s not just Jurassic Park inspiration, but it is a place that transforms you to somewhere else instantly. 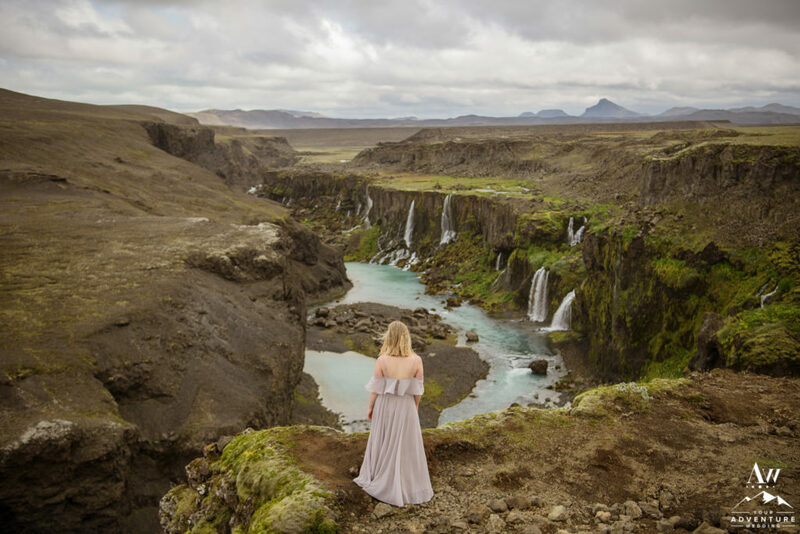 You look out and forget anything that plagued your mind and you are just there in that moment (rare these days, eh?). 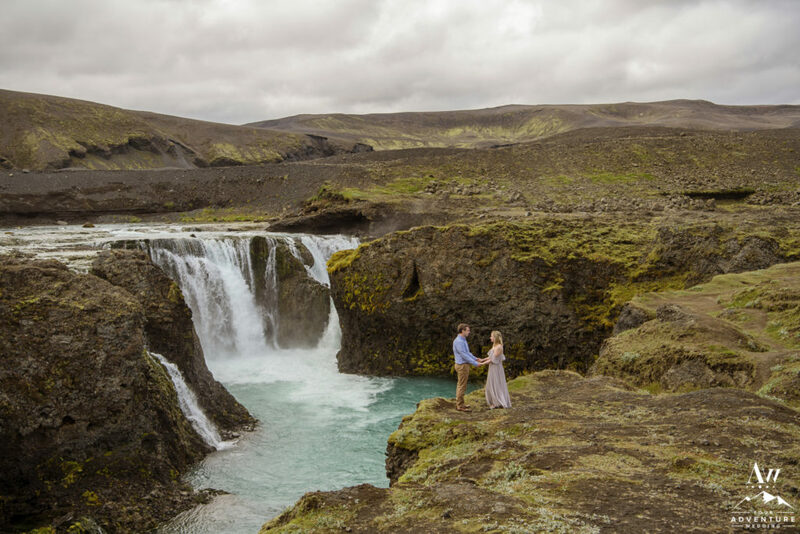 We actually had not fully scouted every inch of our favorite “Jurassic Park” when they had come for their waterfall wedding anniversary session. 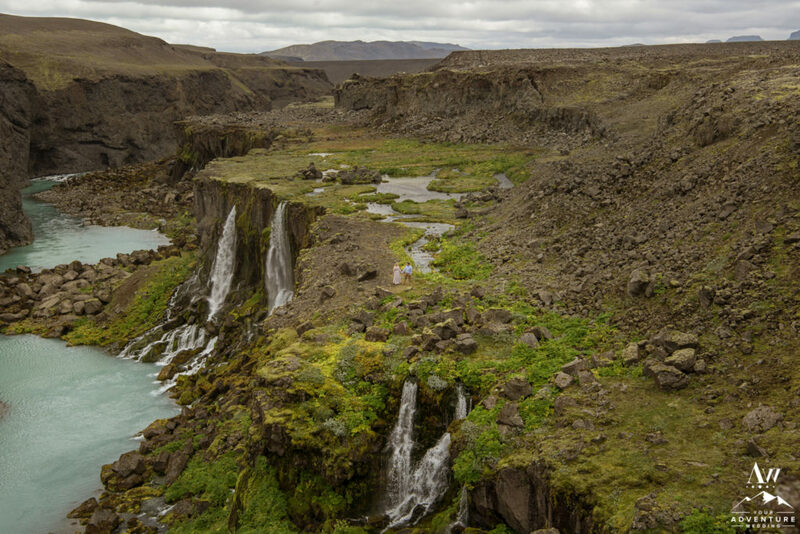 Casually suggesting that it would be super fun to hike down to the lower level of the falls, they immediately said they “wanted to be the first!” Heck yes!! 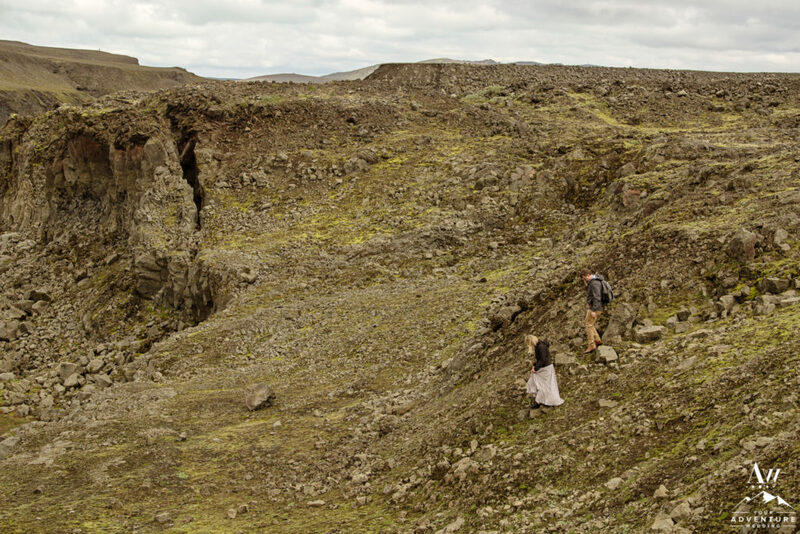 They changed shoes, packed a backpack and they were on their way hiking down. 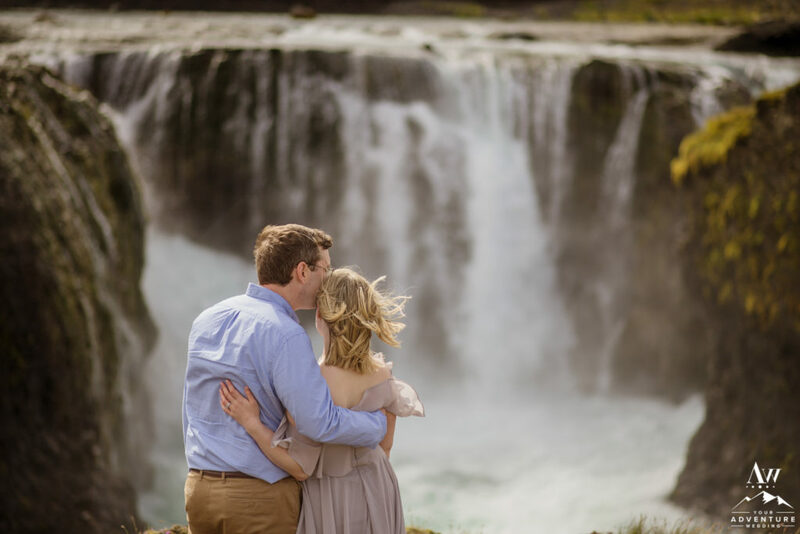 One of our favorite waterfall wedding anniversary session images is John jumping over the several rivers they needed to either forge or jump. Jumping is always more fun and look at the height he got! Bravo John!! 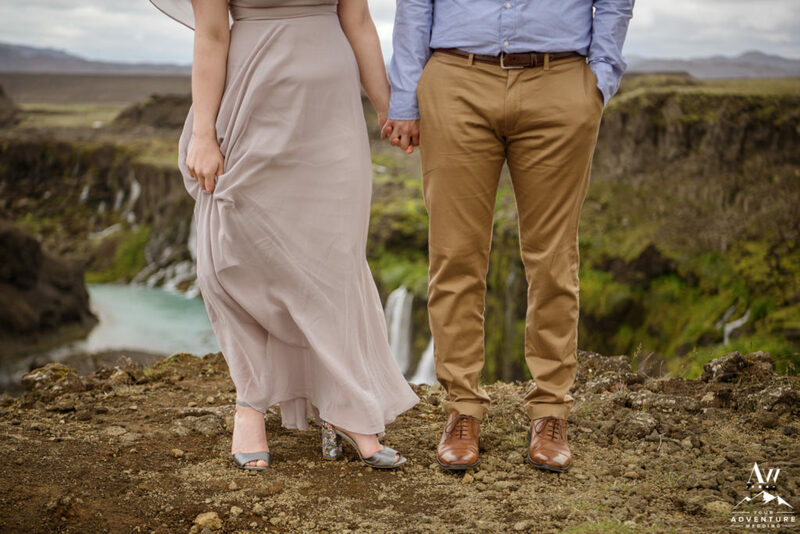 Oh la la and look how freaking dreamy Rachel’s dress flew around in the wind too! Just a dynamic gorgeous couple!! 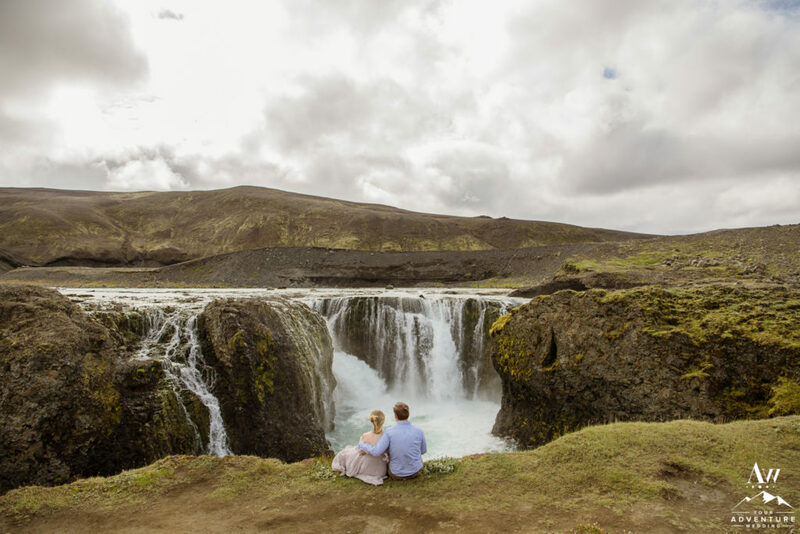 Has Rachel and John’s waterfall wedding anniversary adventure inspired you to plan your own? 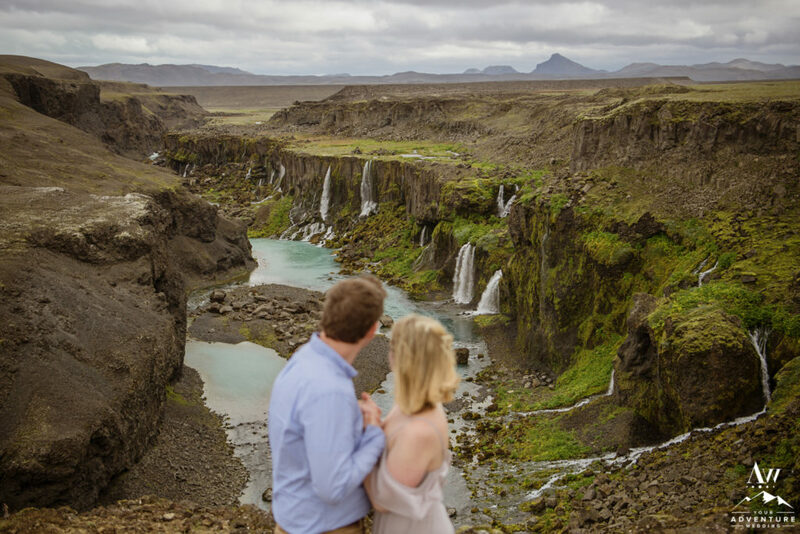 Feel free to contact us for more information on planning an epic day all to yourselves.